(Do not spell out everything, check lists can not fly planes). San serif is better (Helvetica)! Should not exceed 60-90 sec for a "pause point". After this, the check list becomes a distraction. People start to "shotcut" steps. (Images & text below are from "Balaguru et al. Curr Probl Pediatr 2000;30:5-30"). Excitation-Contraction Coupling: This is the mechanism by which electrical depolarization (excitation), results in contracton in a cardiac myocyte. Calcium acts as the secondary messenger making that coupling. In adult cardiac myocyte, sarcoplasmic reticulum (SR) acts as the main store of calcium. Upon depolarization of sarcolemma, a small amount of calcium enters the cell through L-type calcium channels. This small amount of calcium activates calcium release channels (Ryanodine receptors) in junctional SR - causing release of large amount of calcium into the cytoplasm from calcium stores in SR. This is called Calcium-induced Calcium Release (CICR). Increase in cytosolic calcium activates myofibrils to contract. 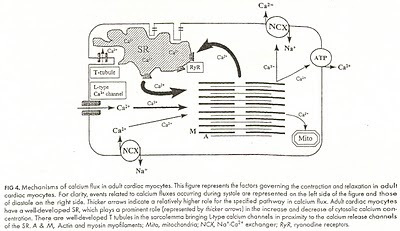 During diastole, the fall in cytosolic calcium concentration occurs through reuptake of calcium into SR stores (~80%), calcium efflux out of the cell via Sodium-Calcium Exchanger (NCX; ~20%) and via sarcolemmal calcium pump (Ca2+-ATPase). In neonatal cardiac myocyte, SR is sparsely developed and poorly organized. So, CICR can not fully function/support cardiac contraction in the newborn. 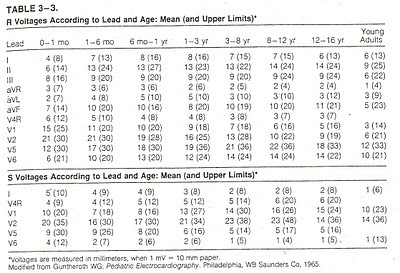 Therefore, neonatal cardiac myocytes depend on trans-sarcolemmal influx of calcium (via L-type Calcium channels & NCX). NCX operates in "reverse" direction during systole in this situation and "forwards" during diastole. 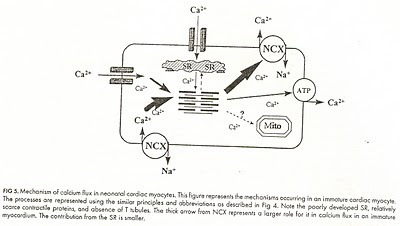 NCX plays a major role in calcium homeostasis in neonate. 1) T-tubules: Invaginations of sarcolemma that help to increase the cell surface area for a given cell volume. T-tubules bring more of the sarcolemmal L-type Calcium Channels in proximity to ryanodine receptors of the SR. Thus, T-tubules enhance the efficiency of CICR. However, in neonatal cardiac myocyte, the T-tubules are absent, which impose a substantial impediment to sarcolemma to SR coupling. 2) Sodium-Pottasium Pump (Na,K-ATPase): This pump, present in sarcolemma maintains an appropriate Na gradient across the membrane. This pump exists in different isoforms. Different isoforms have different senstivity and response to cardiac glycosides - which may explain the relatively high tolerability of neonates and infants to Digoxin. 3) Calsequestrin: Major calcium storing protein inside SR. Activity of calsequestrin increases progressively with development. 4) Actin and Myosin have different isoforms for heavy and light chains - which increase in sensitivity to calcium with increasing maturity, thus influencing inotropy and lusitropy of the cardiac myocyte. 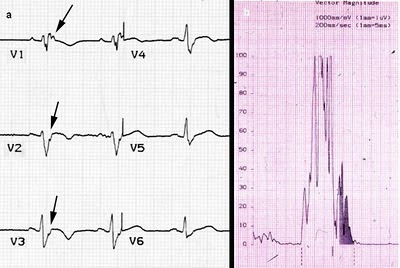 Both panels are from the same patient with and without pacing. Compare the LA traces between the two panels. 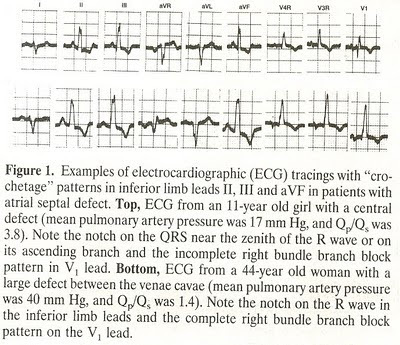 What is the dominant wave in LA trace in this patient? Correlate with EKG trace noted above. Comment on the CVP trace. Why aren't there any waves? 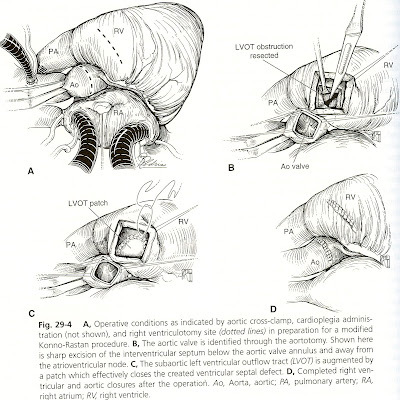 Authors report surgical experience of 30 children operated for endocarditis in the past 30 years (1978-2007). Strep. 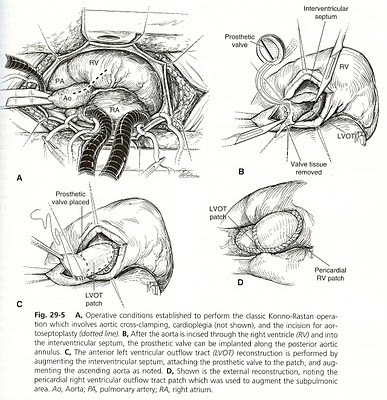 viridans was noted predominantly with known cardiac defects. Staph. aureus was associated with abscess formation, clinical sepsis, acute deterioration and death. 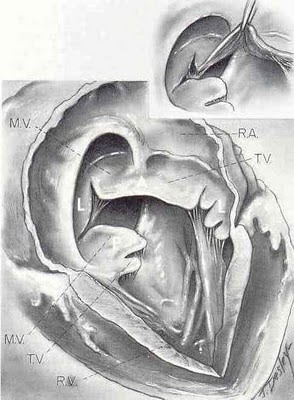 Aortic, mitral and tricuspid valves were involved with equal frequency. 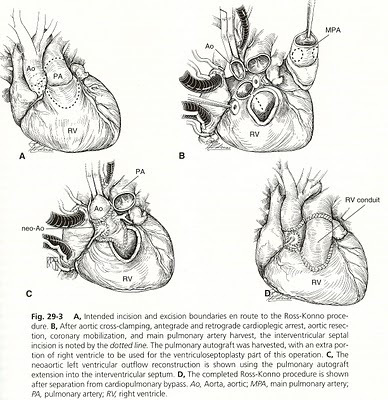 Pulmonary valve involvement was rare. 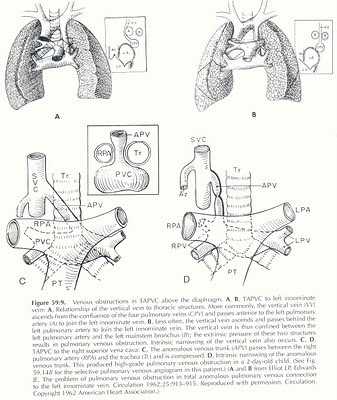 Native valve was preserved in 22 children (73%). Univariate predictors of valve replacement were increased valve thickening and septic emboli (Severity of valve regurgitation was not predictive). Good paper. 2) Circulation 2010;121:1005-13. 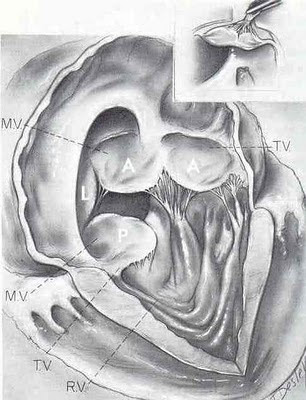 Lalani T, et al. Analysis of impact of early Surgery on in-hospital mortality of native valve endocarditis. Data from an international registry. Non-randomized, retrospective study. So, of limited help. But, still useful information from a large cohort. Conclusion is that early surgery for native valve endocarditis has benefit of lower mortality compared to medical therapy alone. (Defn. 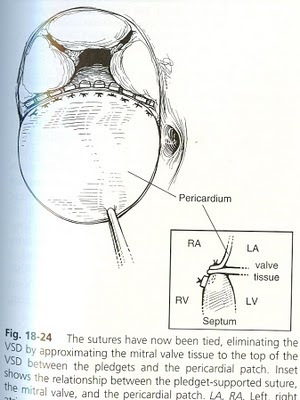 of early surgery is replacement or repair of valve during initial hospitalization for IE). ...Read als0, the editorial on this article at Circulation 2010;121:960-2. 3) European guidelines for prevention, diagnosis and treatment of infective endocarditis. Quite useful. Eur Heart J 2009;30:2369-2413. (i) ACC/AHA 2008 Guideline Update on Valvar Heart Disease: Focus on infective endocarditis. Circulation 2008;118:887-896. (ii) ACC/AHA 2005 Guideline: "Infective Endocarditis: Diagnosis, Antimicrobial therapy and management of complications" Circulation 2005;111:3167-3184. Or, the full text version (44 pages long) from AHA website. Nicks - aortotomy extended through non-coronary sinus and anterior mitral leaflet (prosthetic patch). 2) Managouian - aortotomy extended through left and non-coronary sinuses and anterior mitral leaflet (prosthetic patch). Nunn GR. Semin Thorac Cardiovasc Surg Pediatr Card Surg Annu. 2007:28-31. 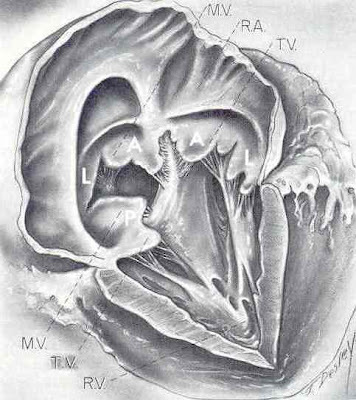 And, at the interatrial septal level. 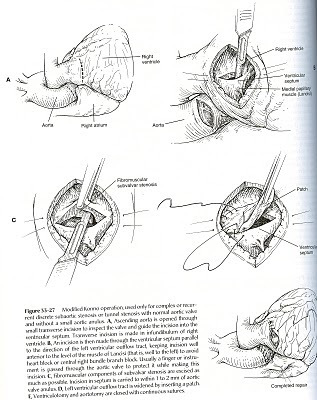 Image from Moss and Adams Fifth Edition 1995.
p 65: ...the medical way of dealing with extreme complexity - with inevitable nuances of an individual patient case - is to leave them to the expert's individual judgement. You give the specialist autonomy. In this instance, Rouillard was the specialist. Had the building site been a hospital ward, his personal judgement would hold sway. 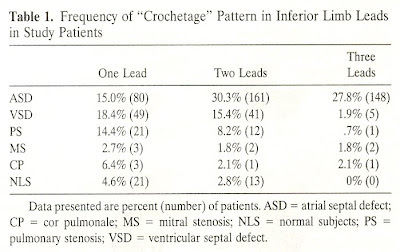 "Crochetage" is a notch near the apex of R wave in inferior limb leads. First reported in 1959 in 11 pts. with ASD. Mechanism of production of this crochetage is not known. 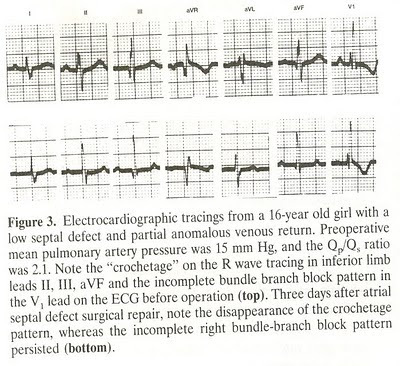 (iii) Crochetage always involves the first 80 ms of R wave, while iRBBB involves the last part of R wave. Examples from 2 patients: Disappearance of "crochetage" 3 days after surgery for ASD: Crochetage is not unique to ASD...and is noted in normal children too! For ASDs, crochetage is not any more sensitive than iRBBB. 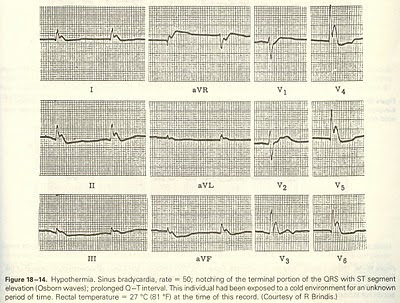 ECG recording: (a) post-excitation epsilon wave (arrows) in right precordial leads; (b) positive late potentials at signal-averaged electrocardiography (SAECG). Anerobic Threshold: Time at which the patient starts to exhale increasing amounts of carbon dioxide (VEco2) to compensate for a build up of lactic acid and resulting metabolic acidosis. At AT, lactate starts to accumulate. Since it is a weak base, it readily dissociates releasing H+ ions. These H+ ions are bufferred by bicarbonate system. This generates extra CO2. This results in increased rate of release of CO2 (VEco2) without a concomittant increase in oxygen consumption (Vo2). At this point, there is hyperventilation relative to Vo2, but not relative to Vco2. This is Anerobic Threshold. 3) V. fib (when rectal temp falls below 28 degree C.
4) Fink EL, Clark RS, Kochanek PM, Bell MJ, Watson RS. 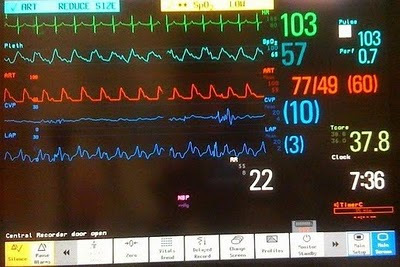 A tertiary care center's experience with therapeutic hypothermia after pediatric cardiac arrest. Pediatr Crit Care Med 2010 Jan;11:66-74.